There’s a long history of social cycling here in Vancouver. The original Terminal City Cycling Club was active as far back as 1892. 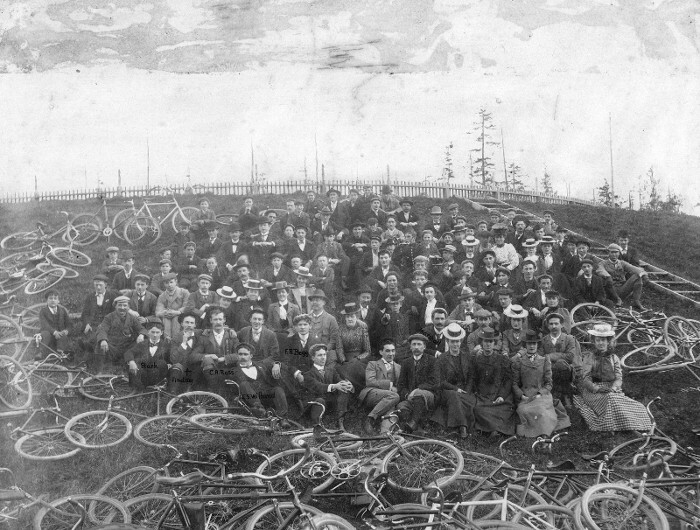 The Terminal City Cycling Club, August 12 1892. At Vancouver Water Works Reservoir, beside the park road, a short distance south of Prospect Point. It was a circular embankment creating a large pool of water. It was demolished in october 1948, levelled, and a picnic ground created. The club held occasional “rides”; this is one of them. Over fifty bicycles, known as “safety” type, to distinguish from the dangerous old high wheel, are shown here, and over 100 cyclists. The buglers, one in uniform, controlled the ride with recognized calls. Here there are seventeen ladies, but some may not have ridden; very few ladies rode, and those who did, rode “ladies’ bicycles”. The automobile had not been invented, and it is observed that several herein appearing were in later years, among the earlier motorists of Vancouver. As witness, F.R. Begg, the Starks, C.A. Ross, Matt Barr, & others. The greamain problem was where to go. The roads where any existed – were so rough and uneven. Grandview was a clearing; Point Grey Road, North Arm Road (shaughnessy), Westminster Road (kingsway) were slits in the forest, Burrard street ended at St Paul’s Hospital, and Davie street was a winding trail which led into the west end clearing and lost itself. Cinder bicycle paths – about four feet wide – were beside the wood plank sidewalks on Georgia, Seymour, Third ave, Westminster ave, and Powell street, but for four or five blocks only. The park road, paved with white calcinated shells from the indian midden, was an ideal place to ride. Though the original Terminal City Cycling Club faded away long ago the stage was set for social riding here in Vancouver. Fast forward to the 1980s… A local entheusiast – Rod, or “The Rodfather” began organizing social rides focused on vintage cruiser bikes. This evolved through the 1990s to become a huge group with a significant following and a detailed event calendar. In those days of course everything was organized through photocopies and phone calls – the annual ride calendar would be found stuck to the wall in your local bike shop. Around 2005 I started Vancruisers.ca as a way to help transition paper and phone calls in to websites and email as well as popularizing our Friday ride. At the time cruiser bikes were booming – Vancouver was home to several cruiser-only shops such as Reverend Cycle, Ride Away and Denman Bike Shop. Social cycling in Vancouver was becoming more and more common, though the question of where to ride was still a big one. While you could ride around most of False Creek many areas were still a construction zone or vague channels through the leftover wreckage of Expo ’86. Stanley Park continued to be the home to most of our rides with a few other occasional routes. A severe winter storm hit Vancouver in 2006. Damage to the city was extensive with fallen trees everywhere. One of the worst hit areas however wast Stanley Park; trees had fallen everywhere, there was significant damage to the Seawall itself with entire sections washed away by storm driven waves. Most of the trails in the forest itself were impassible and downright dangerous – trees which had been toppled but had hung up in the branches of trees still standing continued to fall for months after the storm. With the park essentially unrideable we were forced to look elsewhere in the city – this led us to many new routes and rides as well as establishing Mountain View Cemeterey as a somewhat regular stop – our group had stretched its wings. 10 years later, while we still definitely have a massive Vintage Cruiser contingent we definitely are seeing a much more diverse group of bikes riding with us. Likewise the “new school” cruisers have definitely reduced in number – there was a time when half the bikes on a ride were Felt, Electra, Nirve, etc while today they are a small minority at best. There has also been a significant increase in the number of other social cyclist groups here in Vancouver (Bike Rides Society, Velopalooza, etc). A common theme we keep encountering when talking with folks in those other groups is “Oh yeah, I know about your rides. I don’t have a cruiser though…” Wait! We never said “Cruisers Only!”, the focus was supposed to be on social cycling! With that in mind we decided to make some changed in 2016 to better reflect the social cycling community. To begin with we needed a way to organize that didn’t have “Cruiser” right in the name. We have a great group of folks with the Vancouver Wheelmen Vintage Bicycle Club to promote vintage rides so we felt that it made sense to raise the profile of the Wheelmen as “The” vintage cruiser group. We wanted to respect and represent the history of social cycling here in Vancouver so we thought about adopting the Terminal City Cycling Club name, but the word “Club” was a bit of a sticking point – these rides are supposed to be a welcoming social experience for anyone to join. Whether you show up on a 100 year old Elgin or a brand new commuter bike you are welcome to participate, no “club” membership required! And that is how Terminal City Riders came to be! Welcome and enjoy the ride!